Public Act 375 passed December 22, 2010 requires a yearly Body Art Facility License issued by the Michigan Department of Community Health in order to perform tattooing. If caught tattooing without the required licence, tattooists face up to 93 days in jail and a fine of up to $2,500 for each violation! Only a facility can be licensed. The State of Michigan maintains an online list of all body art licenses. It’s kept very up to date. Some tattooists that tattoo out of their houses present a certificate to convince potential clients that they are licensed. That is probably a Red Cross certificate. It is not a State tattooing license. If they say it is, they are lying. 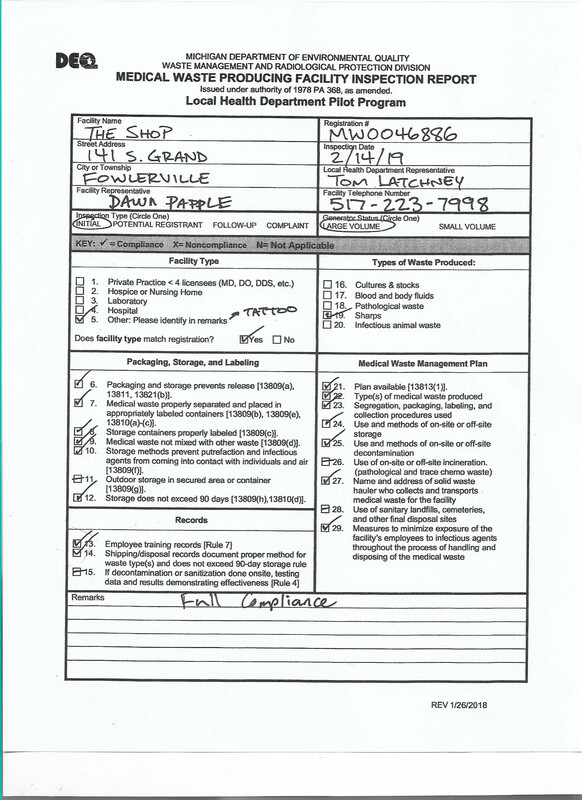 An individual tattoo artist can no longer be licensed in our state – period.